Renewable output rose by 27 per cent over 2017 due to windier weather and new capacity coming online, according to the latest Electric Insights report from Imperial College London. Wind, solar, biomass and hydro together produced 96TWh of electricity during the year – more than enough to power the whole of Great Britain in 1958. The quarterly report commissioned by Drax shows low-carbon sources, including nuclear, accounted for half of all electricity production, as fossil fuel generation dropped by a tenth. 2017 was a “watershed year” for wind, as output swelled by 45 per cent to 45 TWh – almost double the figure for coal. Its share of total generation climbed to 15 per cent from 10 per cent in 2016, reaching 19 per cent over the last three months of the year. The record for peak output was broken four times during the quarter, culminating at 12.4GW on New Year’s Eve as Storm Dylan swept across the North Sea. Wind has continued to set new records in 2018. After plummeting by 60 per cent in the previous 12 months, coal output fell by a further 25 per cent, leaving it as the “preserve of colder months” when demand is greater than 35GW. April saw the first ever full day with no generation whatsoever and across the year there 618 coal-free hours. Solar was a major supplier during summer months, providing more power than coal on 183 days. Great Britain’s power system once again enjoyed its greenest year to date. Carbon emissions fell by 12 per cent to 72 million tonnes, giving an average carbon intensity of 237gCO2/kWh. Instantaneous carbon intensity hit a new record-low of just 56gCO2/kWh in October and there were 139 hours with a carbon intensity of less 100gCO2/kWh, compared to just four hours in 2016. “Generation from coal continues to fall and is now the preserve of colder months as opposed to being the mainstay of generation as it was in 1958,” explained lead author Iain Staffell from Imperial College London. 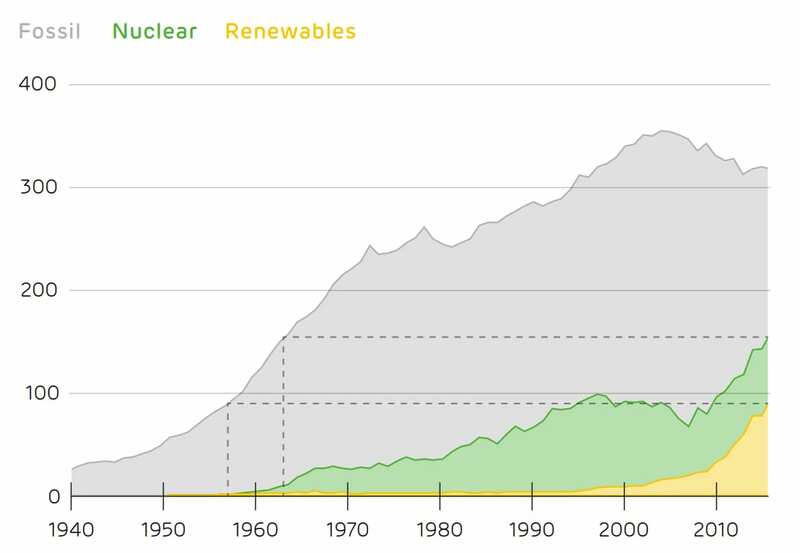 “60 years ago, the power system emitted 93 million tonnes of CO2; in 2017 renewables managed to produce the same amount of electricity by emitting just three million tonnes.